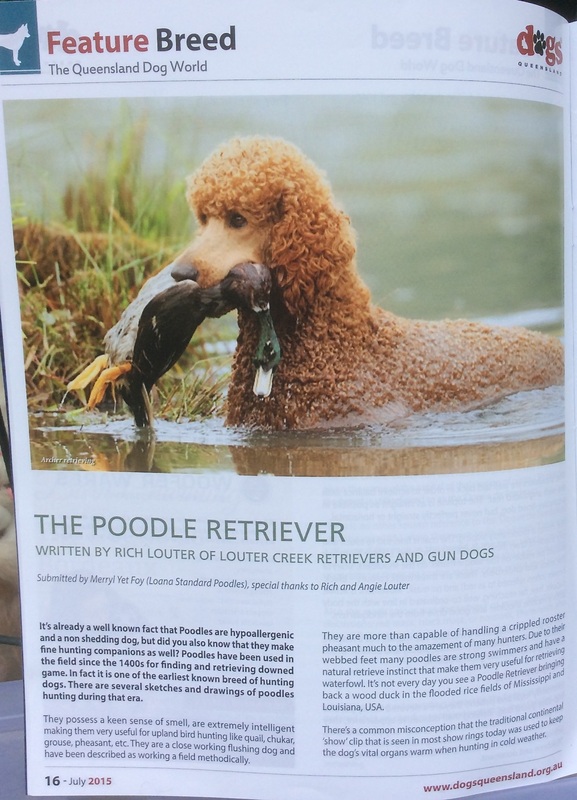 Welcome to Louter Creek Hunting Poodles. Located 30 miles south of Atlanta, Georgia. We are happy you stopped by and hope you visit often. 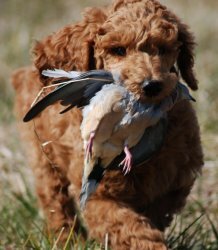 We at Louter Creek Hunting Poodles are currently breeding and training some of our Standard Poodles for Waterfowl Hunting. 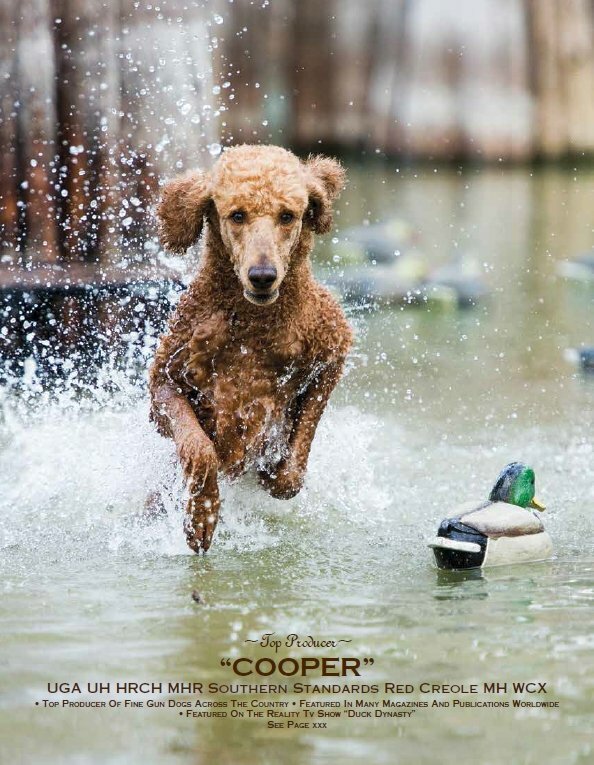 As you know, Standard Poodles were originally Water Retrievers and today still make great working dogs and retrievers. They are excellent working dogs as well as outstanding companions and pets. 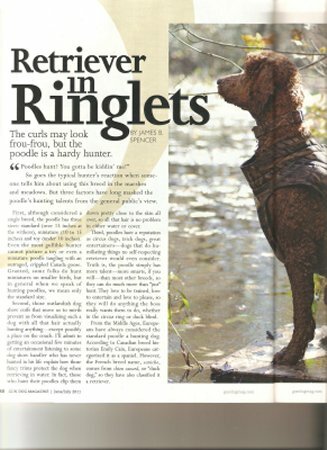 Standard Poodles are highly intelligent dogs, possibly the most intelligent of all canine breeds. You too can enjoy this versatile, magnificent breed with your family. Early training and obedience is the key to having a great family pet that you can live with and be proud of. 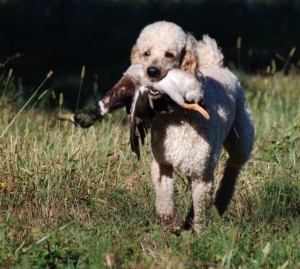 Our Poodles are worked with on a daily basis, including obedience, and retriever training. 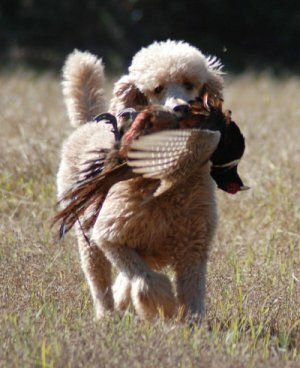 We are one of the few breeders of Standard Poodles that not only run hunt tests, but actually hunt with our dogs. The hunt tests are a lot of fun as we made new friends along the way and have learned about the different retrieving breeds. 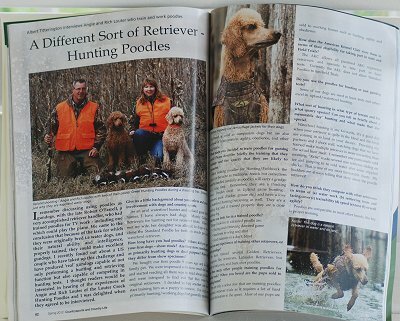 It's not every day you see a Poodle at a hunt test surrounded by a seas of Labrador Retrievers, Golden Retrievers, and Chesapeake Bay Retrievers. 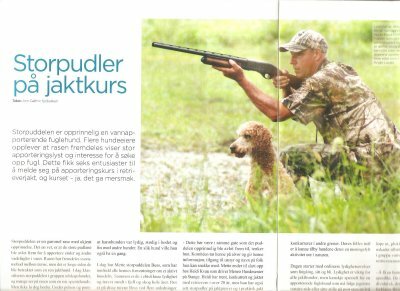 We are looking forward to the Fall hunt tests and hope to have a good hunting season! Our Poodles are gently raised with the love and affection of our family. 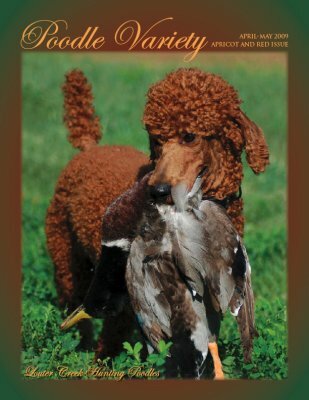 We aim to provide high quality standard poodles of excellent type and temperament. Our sire and dams are genetically tested, including their hips, elbows (OFA), eyes (CERF) and test for bleeding disorders (Vwd). 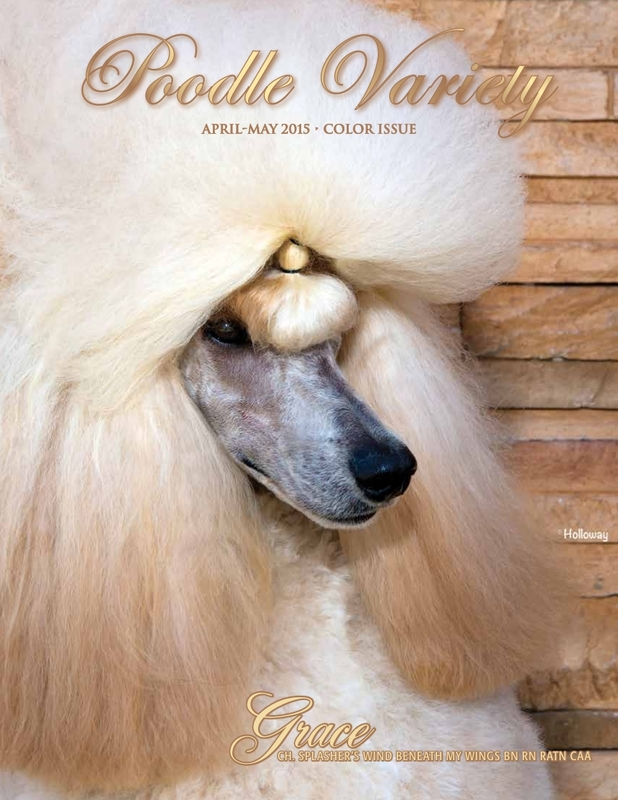 We breed occasionally, selectively, and adhere to the Standard Poodle breed standard. All of our puppies are AKC registered and come with limited registration, and a two year health guarantee against genetic diseases. 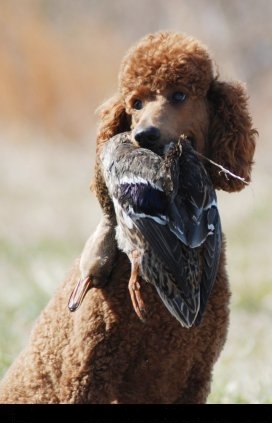 Louter Creek does not approve of, or condone the crossbreeding of Standard Poodles. 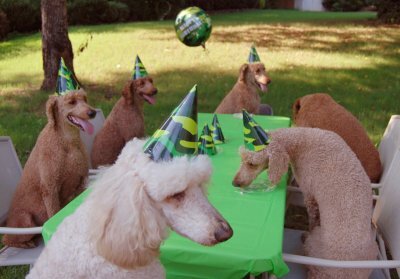 Standard Poodles are hypo-allergenic and do not shed. Most of all they are wonderful with children as they love to play and do many silly things just as kids do. 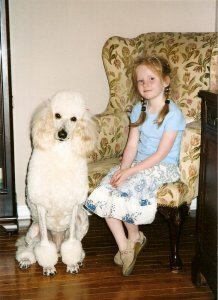 My daughter, Lexie, is the reason why we chose the Poodle. She has asthma and allergies and does extremely well with the Poodles inside the house. Below is a picture of Lexie with her first our cream female "Enya". *FLASH* Rich has trained for and earned over 86 Working Field Titles on Poodles to date! * Check out our new Offspring Gallery page. Our puppies are handled from birth and are well socialized with children, other family members and of course other poodles to ensure that they are social and trustworthy. This makes for a superior adult dog that will be loyal to your family, not to mention a fun and intelligent family member. We do have a 6-8 month waiting list so please inquire and get on our waiting list. 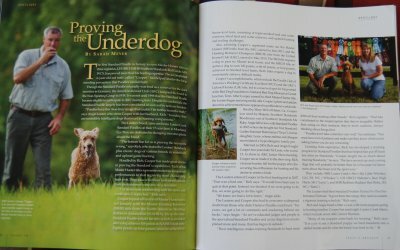 Featured in PURINA Today's Breeder Issue #79 "Proving the Underdog"
AS FEATURED IN THE HUNDESPORT MAGAZINE. 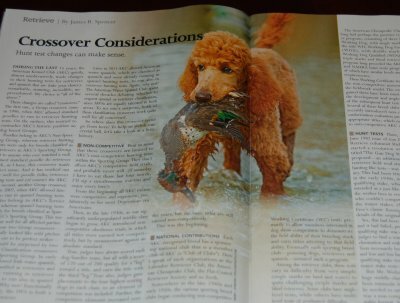 LAYLA FEATURED IN "GUN DOG MAGAZINE"
Salty Dog Publishing just featured one of our pictures as a "Birthday Card"
ducks from a winger at only 10 weeks old!! Visit us on You Tube and see our dogs in action! 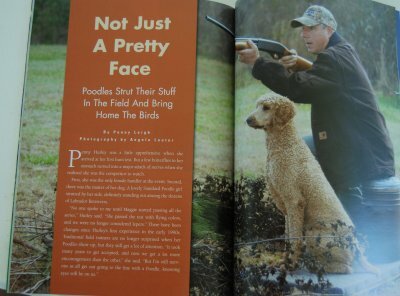 "The Louter's are dedicated to breeding Standard Poodles who are not only excellent companion dogs, but are versatile in their abilities, especially as hunting retrievers. 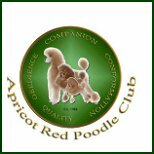 Angie and Rich have done their research, have their poodles genetically tested, provide proper socialization for puppies, and truly care about matching up prospective owners with the right pup. 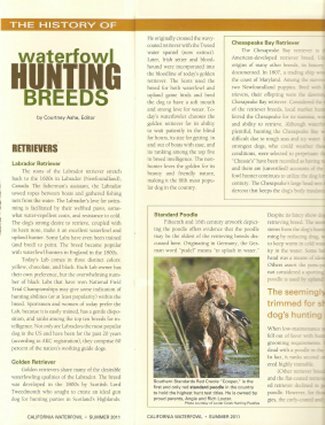 The Louter's gave us good advice from the time we picked "Limit" up as an adorable puppy and continue to give support as "Limit" runs (AKC) & (UKC) hunt tests and starts into other areas in which poodles excel physically and mentally, such as Obedience, Agility, and Tracking. "